The Roadschool Moms team brings you the answer to the million $ question for fulltime RVing families! How do you make money on the road? 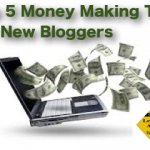 On this episode of Roadschool Moms, Mary Beth (MB) and Kimberly (KT) bring you a viable answer to this question with the first of this five-part series, Making Money as a Blogger. Hit the replay to listen to their exclusive interview with successful blogger, Danielle Leonard, The Frugal Navy Wife. 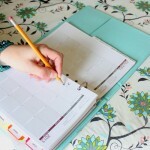 Danielle talks candidly with the RSM duo about the success of her first blog. She also talks about what led her to start a second blog, Roadschooling with the Frugal Navy Wife. Her list of do’s and don’ts will get a new blogger on the road to revenue in a snap. 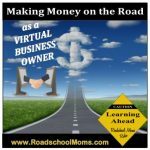 This isn’t the first Roadschool Moms episode dedicated to making money on the road. MB and KT talked about bringing in the green in one of their very first podcasts featuring three (3) fulltime RVers that were funding their travels successfully from an independent location income stream. Through their experience these two fulltiming RV entrepreneurs later broadcasted their Top 10 Ways to Make Money on the Road. Scroll through the RSM library on iTunes of more than 100 podcast replays to find more episodes about the roadmap to finding revenue on the road. 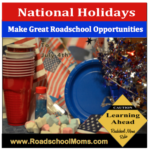 Roadschool Moms is a live, one-hour weekly broadcast dedicated to the needs and challenges facing today’s roadschool moms. Kimberly Travaglino, co-founder of Fulltime Families, and Mary Beth Goff, the creator of Road Trip Teacher, team up every week to offer listeners a fresh take on homeschooling while traveling full time across America’s backyard.